HOW TO STOP YOUR CAT SCRATCHING FURNITURE? This resource is essential as all cats need to scratch! Scratching is a natural need for all cats. When scratching, they mark their territory. This territory marking is both visible (the scratching lines) and invisible! Indeed, cats leave “territory messages” coming from their paws, that only other cats can perceive. In case of discomfort, cats will scratch more, and this can become an issue if this happens on your walls, doors of furniture! In many cases, scratching in your home is in fact your cat’s way of expressing discomfort. It is particularly true for kitten and newly adopted cats, who discover their new home. Your cat is scratching in many areas in the house (on furniture, sofa, chairs...). You had recent changes in your home (like new furniture or moving furniture around). 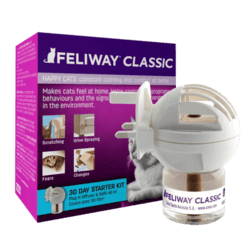 FELIWAY CLASSIC can provide and create a loving and reassuring atmosphere in your home that will help stop cat scratching. Never use FELIWAY CLASSIC Spray on the scratching post as it would prevent the cat from using it! 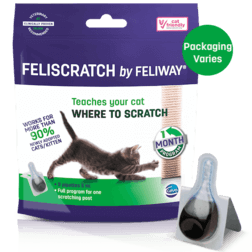 Using FELISCRATCH by FELIWAY will help teach your kitten or newly adopted cat to scratch on an appropriate location: a scratching post! To learn more read our article on Why do cats scratch? There are many anecdotal ways to stop cats scratching furniture. Some of these involve homeopathy or old wives tales. Cats scratching is normal and essential for cats. It helps them tell other cats that it is their territory. Also it is an indicator of a cats feelings, if your cat is feeling uncomfortable then the may scratch more and in more places. What ever the reason for the scratching a cat needs to scratch especially when they first wake up in the morning. So placing a scratching post near their bed is ideal. Other solutions to stop cat scratching include adding various ingredients (which cats do not like) to water and spraying on furniture. Just be careful that the ingredients you use do not damage your furniture. The alternative the these home remedies is to use a scientifically proven product like the products in the FELIWAY range. To read more our article on alternatives or home remedies to stop cats from scratching the furniture. Excessive scratching can be due to stress. Cats like to scratch certain materials and your cat may like to scratch carpet, this is not uncommon. To learn more about what you can do to stop cat scratching carpet.